Happy Wednesday! In with Tara in that intros are the hardest. But I’m like that with everything. Let’s cut to the chase, I don’t have patience for pleasantries. Today’s supposed to be a What I Ate Wednesday, but I have been pretty lousy managing the food log lately. I usually snap a picture of my meals and journal all my meals/snacks in my notebook, but the last couple weeks that habit has sort of fallen to the wayside while I’m working on other habits like making my train on time. I’ll need to work on this new normal. In the meantime, here is some random eats that I did capture recently, in no particular order. Sunday night Hulk expressed desire to brown bag his lunch, so I offered to do a lunch cook-up for the two of us. 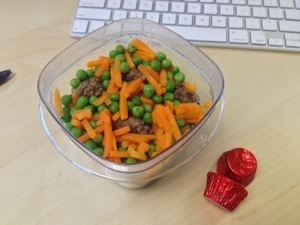 Hamburger, onions, spices, peas and carrots were fried up and distributed into containers to grab-and-go. Tuesday I paired my container with a couple of mini peanut butter cups. Strictly for artistic appeal, I swear. 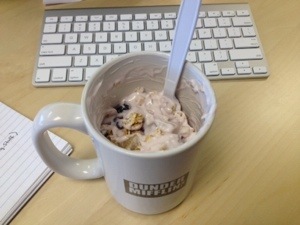 Mid-morning snack of Chobani, a ripe plum, and a small sprinkle of granola. One of my Cooksmarts dinners. Note to self, I still need to do a recap on that. 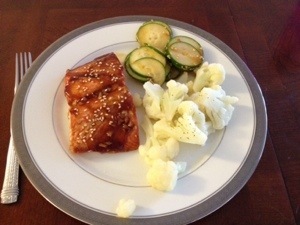 Salmon with teriyaki sauce, cauliflower, and cucumber salad. Brekkie! 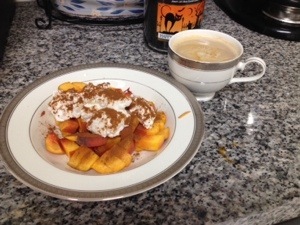 A not-so-ripe peach under a mountain of Greek yogurt of questionable expiration (I had to scrape a little mold from the container; the rest was destined to garbage disposal-ville), cinnamon, an coffee. Honestly, I am impressed that I had roughly a full day’s worth if eats on my camera roll. In other news, in still battling this little bug that’s given me the sniffles and a bit of a cough. Squish has the same thing, so now I know where it came from. It’s not too bad, it’s just annoying. Especially when I realize I am no where near a tissue or something to blow my nose with, and I’m stuck doing that super-annoying sniffing. The only thing worse than intros is closing. Okay, I’m done now. Have a most wonderful day! Haha, yes. Can’t forget about closings? It’s usually like the awkward “okay, I’m just going to shuffle out of here now…bye!” dance after each post. I’m eyeing your Dunder Mifflin cup, maybe I will get you a World’s Best Boss one for Christmas. Actually, the other side of the mug says “World’s Best Boss”. And it holds a tall Starbucks! Best mug ever. I remember an ad that ran a while ago saying, “Get in, get out, get on with your life.” That’s what I feel like all the time. Was it Walmart? Must not have been a good ad campaign if I can’t remember!